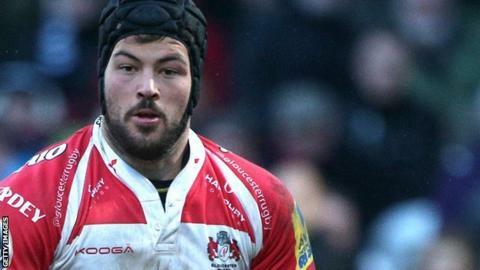 Gloucester back-row forward Gareth Evans could be out for up to six months with a knee injury. The 22-year-old, who has made 18 appearances this term, was hurt in a tackle during the first half of last Saturday's 18-17 loss against Bath. Matt Garvey received a yellow card for the tackle on Evans. Gloucester boss Nigel Davies told BBC Radio Gloucestershire it looked like a ligament injury and was "pretty serious". He added: "It is very disappointing for him because he has been fabulous. "He can't have been far away from international honours. He can, at this stage, play for Scotland, Wales or England. It's a real shame." Evans, who came through the club's academy to make his senior debut in 2012, earned his first Premiership and Heineken Cup starts this season. He was among nine players to sign new deals earlier this month.